Globally, the deleterious and hazardous effects of cigarette smoking and other tobacco usages affect public health. According to currently available records, approximately 5 million people are under the direct adverse influence of continued tobacco use. Furthermore, it is assumed that this number would increase to 10 million by the year 2030, with 70% of deaths occurring in low- and middle-income countries. Cigarettes, cigars, and pipe tobacco are the usual forms of tobacco smoking. Cigarettes are the widely used tobacco products, which are often smoked globally. Across the world, about 1.1 billion adults (29% of the adult population) are cigarette smokers. Smokeless tobacco (ST) includes products that are consumed orally. They are of two major forms: snuff and chewed form. Snuff may be available in the form of moist or dry bolus, the former being taken as oral snuff and the latter usually inhaled through the nose. While chewing, the ST variety is usually placed in the buccal vestibule of the oral cavity. It is called as “chaw” or “quid” and exists in three different formulations: loose leaf, plug, and twist. ST is most commonly consumed in Scandinavian countries compared to the other parts of Europe. They are also consumed in other countries growing tobacco crop such as India and the United States. Among the ST types, snuff is very common in Sweden (locally known as suns). In India, many tobacco consumption patterns are used because many tobacco products are commercially available. On the basis of the form of tobacco usage, many tobacco products are available, that is, raw, processed mixtures, and pyrolyzed forms. The raw forms consist of the flakes of plain tobacco leaves mixed with lime, areca nut, and/or other condiments, which are sun cured or air cured. Mishri, bajjar, etc., which are pyrolyzed forms, are used as dentifrices. In some parts of India, oral snuff is used. After the introduction of gutka, the marketing and commercial production of ST has been up scaled. In India, cigarette smoking is the most common pattern of tobacco consumption. Various studies had reported tobacco smoking as a risk factor for periodontal disease and increased tooth loss. Previous studies reported that with the number of cigarettes smoked per day and the duration of years, they noticed a relationship between the prevalence and severity of periodontal disease. Dental caries is a polymicrobial disease caused by various associations and is not infectious. It is considered a diet- and pH-dependent process due to the acid demineralization of the tooth enamel by sugar-fermenting microorganisms. The data on dental caries prevalence in tobacco smokers and chewers were not completely known. The literature discussed both the increased and decreased prevalence of dental caries in tobacco users. However, such data are sparse from the Indian subcontinent. Thus, the objective of the study was to assess the prevalence of caries in smokers and ST users and compare it with that of nonusers using caries index. It may be emphasized that the objective of the study does not cover the prevalence of caries in patients with multiple tobacco-related habits. The present observational study was designed to estimate the prevalence of caries in the patients who have been using tobacco in either smoking or smokeless forms. The study was conducted in the Panineeya Institute of Dental Sciences, Hyderabad for a period of one year between June 2015 and June 2016. The ethical clearance number allotted was PMVIDS and RC/IEC/OMR/PR/0046-15. The institutional ethical review board approved the study protocol, and written proper consent was obtained from the patients. All the patients were recruited in accordance with the ethical standards of the responsible committee on human experimentation. A clinical oral examination was performed on 549 individuals. Dental caries scores using Black’s classification was recorded in all the individuals attending the outpatient department. There were two examiners allotted for examining the oral cavity after preliminary data were entered in standard pro forma. Primary investigator was the sole authority for deciding if there were difficulties in the implementation of the examination protocol. A simple random sampling was performed during recruitment. All 549 patients of both gender and aged between 18 and 75 years were categorized into three groups. Group A had 199 patients who were habitual smokers with a history of habit for a minimum of 6 months. A thorough clinical examination was conducted along with dental caries scores using Black’s classification. Similarly, Group B had 150 patients with a history of tobacco usage in smokeless form and had abused it since 6 months. Group C comprised the control group, with 200 patients who did not have any smokeless or smoking tobacco habit. All data pertaining to the habit duration, type, frequency, and form were recorded in a preformed pro forma. Conversely, patients who were clinically diagnosed with dental fluorosis were excluded from the study. The results, thus, obtained were statistically evaluated using Kruskal–Wallis analysis of variance with post-hoc Conover test using the Statistical Package for the Social Sciences version 2015 software (SPSS Inc., Chicago, IL, United States). A probability level of P < 0.05 was considered to be statistically significant. The study population comprised 549 patients, out of which, Group A had 199, Group B had 130, and Group C had 200 patients. The results obtained are listed in the forthcoming paragraphs. Criteria taken into consideration for tobacco smoking and ST usage groups were type, frequency, time, and duration in years. Group A: Negative correlation (−258) was obtained between the type of tobacco usage and dental caries, whereas positive correlation was derived between frequency (0.321), duration (0.807), and caries score. Group B: Significant correlation was obtained among “type” (0.219), “duration” (0.334), and dental caries score, whereas a negative correlation (−178) was found between frequency and caries score. 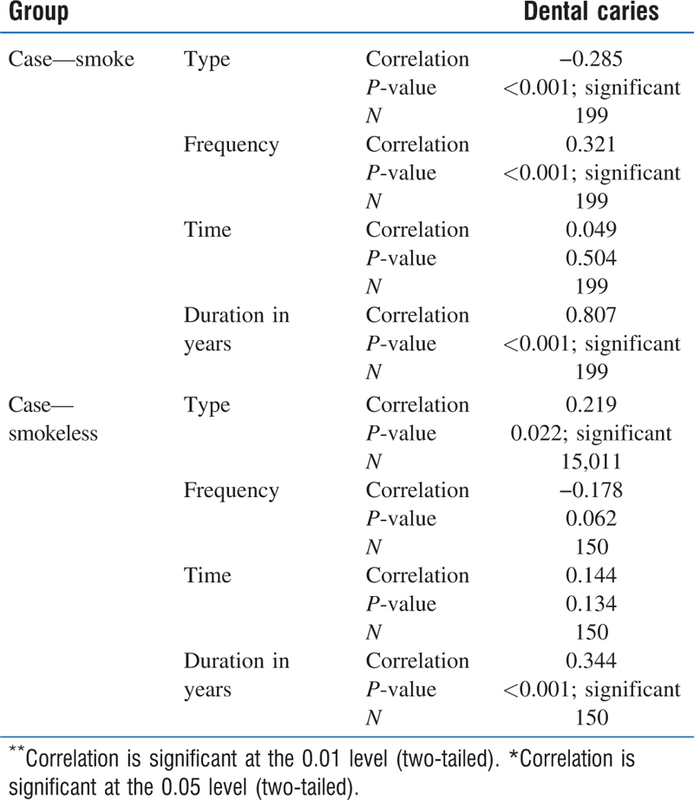 On the basis of the assigned criteria, summarizing the obtained data in smoking tobacco cluster, type, frequency, and duration were found to be statistically significant. Conversely, the time factor was insignificant. The ST usage group had also shown similar findings [Table 1]. The proportion of males was found to be more when compared to females in all the groups. Group A characteristics: The habit of cigarette smoking was found to be dominating in comparison to beedi smoking. A total of 118 patients had a history of smoking 1–5 times/day, and 176 patients reported a time duration of smoking for 1–5 s. A total of 65 patients reported a duration of smoking for <5 years [Table 2]. Caries was reportedly found in 123 males, while females in the age range of 26–35 years had no caries. Group B characteristics: A maximum number of volunteers had the habit of zarda chewing followed by gutka chewing and snuff usage. A total of 77 patients had a history of zarda/gutka chewing for at least 1–5 times/day, and 99 volunteers reported having it for less than for 5 min time duration. 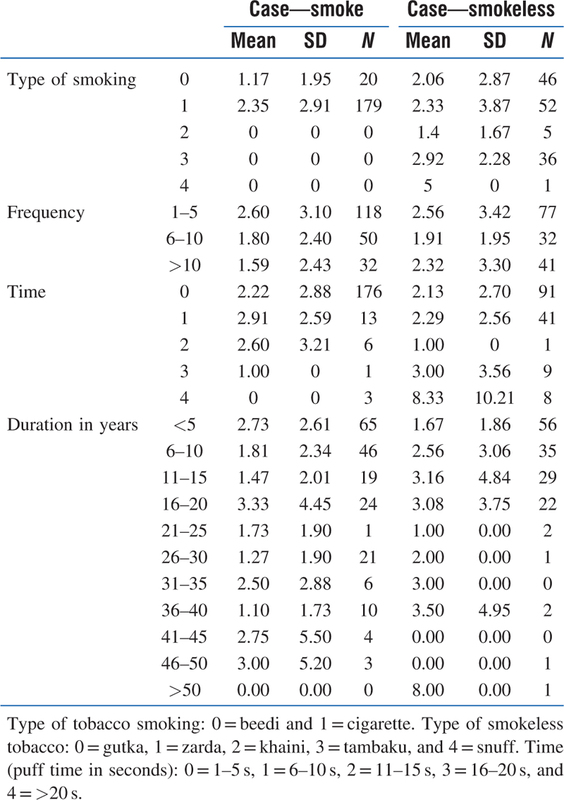 About half of the patients had given a history of duration of habit for a minimum of 5 years [Table 2]. Caries association was found in 74 males and 15 females in the age range of 26–35 years. Group C characteristics: Out of 200 patients, dental caries association was found in 103 males and 88 females in the age range of 26–35 years of age. 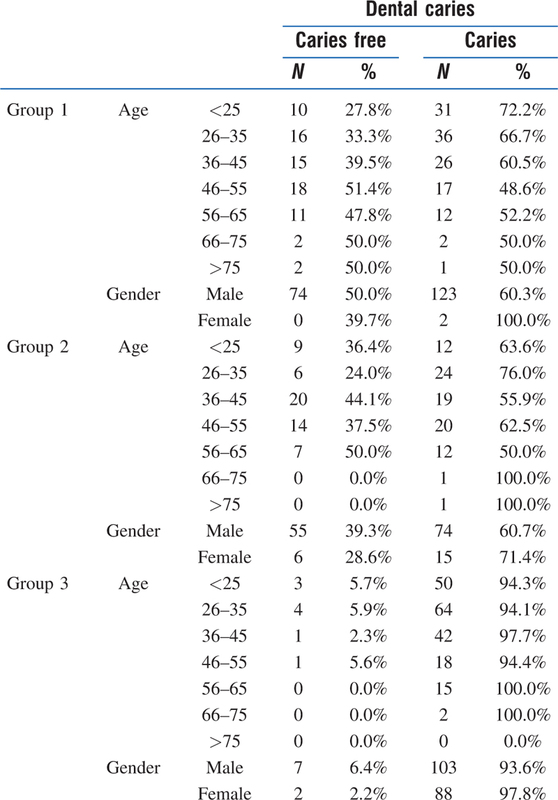 This study showed an inclination of the prevalence of dental caries more in the control group within the age range of 26–35 years followed by the group with ST usage and then the group with individuals who smoked tobacco [Table 3]. In summary, there was more prevalence of dental caries in the following descending order of study groups: control group > ST > smoke tobacco. There was significant difference in mean caries score among the three groups (P < 0.001). Post-hoc test showed that controls had significantly higher mean caries scores than the groups with smokers and ST usage. However, no significant difference was observed between the groups with smoking habit and those with ST usage with respect to mean caries scores [Table 4]. Dental caries is a multifactorial disease characterized by the demineralization of the inorganic portion and the destruction of the organic substance of the calcified tissue of the tooth, which often leads to cavitation. In 1990, Zitterbart reported that smokers had significantly higher decayed, missing, and filled teeth (DMFT) score, untreated decayed surfaces, and missing surfaces, which confirmed an association between smoking and the prevalence of dental caries in adult males. He further correlated that the more the cigarettes were smoked per day, the more the missing teeth were noted in a smoker’s mouth. In this study, males had a more prevalence of dental caries than females. Smoking and its relation to dental caries is a subject of controversy. Early reports in literature indicated that dental caries were reduced in individuals having a smoking habit, which suggests that smoking actually reduces dental caries.,, Schmidt, in 1951, reported that an increase in tobacco smoking led to a decrease in dental caries rate supporting the belief of previous studies. The concentration of thiocyanate, a constituent of tobacco smoke, has possible caries-inhibiting effect. It was found to be higher in smoker’s saliva, thus depicted that smoking had inhibitory effect on smoking. On the other hand, few studies also stated that increased susceptibility to dental caries might be due to possible lower pH levels, a decreased buffering capacity of smoker’s saliva, and the higher number of lactobacilli and Streptococcus mutans., Results from few studies reported that salivary flow rates between smokers and nonsmokers showed no significant differences. To date, significant correlation between smoking frequency and dental caries was found,,,, which was similar to the finding of our study. In 2007, Dietrich et al. studied tobacco use and the incidence of tooth loss among US male healthcare professionals. They found that the data on the dose-dependent effect of smoking and smoking cessation on tooth loss were scarce. They hypothesized that smoking had both dose- and time-dependent effects on tooth loss incidence. A study conducted on heavy smokers attending a military academy showed a prevalence of caries, confirming a correlation between the disease and tobacco use. All of these studies had shown a positive correlation between tobacco use, duration, and type with dental caries. The literature on ST use with either increasing or decreasing dental caries incidence is scarce. Few studies had reported the evidence linking ST use with an increased prevalence of dental caries., In contrast is the case reported by Zitterbart et al., which did not find any evidence of dental caries in the area where quid was placed., Some researches assessed the percentage of the highest amount of caries-promoting factors such as sugar and caries-inhibiting chemicals such as fluoride in commercially available ST forms. Generally, ST presented a significant role factor for the promotion and development of dental caries. More dental caries were reported in individuals who chewed tobacco than nonusers. Similar findings were reflected from our study results. Data from the multipurpose health survey (Third National Health and Nutrition Examination Survey) conducted in the USA from 1988 to 1994 were used to examine the relationship between chewing tobacco and the other forms of tobacco use and decayed or filled coronal or root surface caries. The results of the study stated that tobacco chewers had a slightly higher mean for decayed and filled coronal surfaces than individuals using the other forms of tobacco. In addition, the mean number of decayed and filled root surface for those who used chewing tobacco was four times higher than nonusers. A limited number of epidemiological and experimental results suggested an association between ST usage and dental caries. It seemed that ST played an important role in increased caries activity. This study demonstrated that the prevalence of caries was significantly higher in controls, followed by ST users, and the least in individuals who had a habit of smoking. The reason could have been was the high sugar content in tobacco chewers in the commercial form of gutka. The high prevalence of caries in controls who did not use any form of tobacco could be attributed to poor oral hygiene coupled with an increased consumption of refined carbohydrate foodstuff. The higher prevalence of dental caries in the control group followed by the ST usage group and then the smoking group was probably due to the presence of thiocyanate in the saliva of smokers, which inhibited cariogenic bacteria in them. Conversely, the higher presence of caries in ST usage group might be due to the presence of sweeteners in tobacco-chewing agents. The higher caries prevalence in controls could be due to various caries initiation factors, coupled with a probability of no mechanical clearing effect of plaque such as in the ST usage group. The study was not without limitations. The finding in the study could have reflected more accurately if there was equal, sample distribution among all the three groups with a definitive radiographic evaluation of the suspicious caries of the teeth in addition to clinical examination. There could have been clinical selection bias in the diagnosis of dental caries. Interobserver variability was not assessed, and the sample selection from a single center may have led to variations in the study results, which did not reflect the actual prevalence of disease in the population. Thus, we suggest conducting further studies to overcome the aforementioned flaws. Contrary to the number of studies showing dental caries in smokers, this study demonstrated that the tobacco smokers had less caries when compared to ST chewers. The alarming result of nonhabit controls having increased carious teeth is a matter of concern and requires immediate addressal. Jha P, Chaloupka FJ, Corrao M, Jacob B. Reducing the burden of smoking world-wide: Effectiveness of interventions and their coverage. Drug Alcohol Rev 2006;25:597-609. Winn DM. Tobacco use and oral disease. J Dent Educ 2001;65:306-12. Prokhorov AV, Winickoff JP, Ahluwalia JS, Ossip-Klein D, Tanski S, Lando HA et al. Youth tobacco use: A global perspective for child health care clinicians. Pediatrics 2006;118:e890-903. Anderson P. Global use of alcohol, drugs and tobacco. Drug Alcohol Rev 2006;25:489-502. Walsh PM, Epstein JB. The oral effects of smokeless tobacco. J Can Dent Assoc 2000;66:22-5. Furberg H, Lichtenstein P, Pedersen NL, Bulik C, Sullivan PF. Cigarettes and oral snuff use in Sweden: Prevalence and transitions. Addiction 2006;101:1509-15. Soni PR, DK. Prevalence and pattern of tobacco consumption in India. Int Res J Social Sci 2012;1:8. Clarke NG, Hirsch RS. Personal risk factors for generalized periodontitis. J Clin Periodontol 1995;22:136-45. Kumar S, Prabu D, Kulkarni S, Dagli RJ. Tobacco as risk factor for periodontal disease in green marble mine laborers of Rajasthan, India. Braz J Oral Sci 2015;7:1641-7. Simon-Soro A, Mira A. Solving the etiology of dental caries. Trends Microbiol 2015;23:76-82. Simon-Soro A, Belda-Ferre P, Cabrera-Rubio R, Alcaraz LD, Mira A. A tissue-dependent hypothesis of dental caries. Caries Res 2013;47:591-600. Sathyanarayanan R, Carounnanidy U. Classification and management of dental caries. New concepts. Indian J Dent Res 2002;13:21-5. Zitterbart PA, Matranga LF, Christen AG, Park KK, Potter RH. Association between cigarette smoking and the prevalence of dental caries in adult males. Gen Dent 1990;38:426-31. Hart A. Prevention of decay of the teeth. Dent Items Interest 1899;21:11. Gibbs M. Tobacco and dental caries. J Am Coll Dent 1952;19:3. Schmidt H. Tobacco smoke and the teeth. Stoma (Heidelb) 1951;4:14. Johnson NW, Bain CA. Tobacco and oral disease. EU-Working Group on Tobacco and Oral Health. Br Dent J 2000;189:200-6. Kassirer B. Smoking as a risk factor for gingival problems, periodontal problems and caries. Univ Tor Dent J 1994;7:6-10. Reibel J. Tobacco and oral diseases. Update on the evidence, with recommendations. Med Princ Pract 2003; 12(Suppl 1):22-32. Axelsson P, Paulander J, Lindhe J. Relationship between smoking and dental status in 35-, 50-, 65-, and 75-year-old individuals. J Clin Periodontol 1998;25:297-305. Bruno-Ambrosius K, Swanholm G, Twetman S. Eating habits, smoking and toothbrushing in relation to dental caries: A 3-year study in Swedish female teenagers. Int J Paediatr Dent 2005;15:190-6. Ide R, Mizoue T, Ueno K, Fujino Y, Yoshimura T. [Relationship between cigarette smoking and oral health status]. Sangyo Eiseigaku Zasshi 2002;44:6-11. Kelbauskas E, Kelbauskiene S, Nedzelskiene I. [The influence of smoking on oral health]. Medicina 2005;41:418-26. Dietrich T, Maserejian NN, Joshipura KJ, Krall EA, Garcia RI. Tobacco use and incidence of tooth loss among US male health professionals. J Dent Res 2007;86:373-7. Campus G, Cagetti MG, Senna A, Blasi G, Mascolo A, Demarchi P et al. Does smoking increase risk for caries? A cross-sectional study in an Italian military academy. Caries Res 2011;45:40-6. Sitzes L Jr. On Chewing tobacco [Letter]. ADA News 1977;8:6. Weintraub JA, Burt BA. Periodontal effects and dental caries associated with smokeless tobacco use. Public Health Rep 1987;102:30-5. Zitterbart PM, Marlin DC, Christen AG. Dental and oral effects observed in a long-term tobacco chewer: Case report. J Indiana Dent Assoc 1983;62:2. Going RE, Hsu SC, Pollack RL, Haugh LD. Sugar and fluoride content of various forms of tobacco. J Am Dent Assoc 1980;100:27-33. Offenbacher S, Weathers DR. Effects of smokeless tobacco on the periodontal, mucosal and caries status of adolescent males. J Oral Pathol 1985;14:169-81. Tomar SL, Winn DM. Chewing tobacco use and dental caries among U. S. men. J Am Dent Assoc 1999;130:1601-10.